Astronomy is the study of the sun, moon, stars, planets, comets, gas, galaxies, gas, dust and other non-Earthly bodies and phenomena. 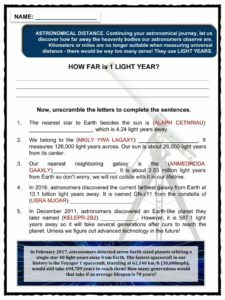 See the fact file below for more information on the astronomy or alternatively, you can download our 24-page Astronomy worksheet pack to utilise within the classroom or home environment. Astronomy began far back when our ancestors believed the gods were the controlling forces of the universe. Back in 10,000 BCE, ancient people believed that the gods were celestial beings found in the skies – embodied in the sun, the moon and the stars. Around 5000 BCE, ancient people began constructing sun observatories, such as the Neolithic era ‘Goseck circle’, to measure the heavens. Around 3,000 BCE the Egyptians had a 365-day calendar, or 12 ‘months’ of 30 days, and an extra five days added on at the end of the year as feast days. 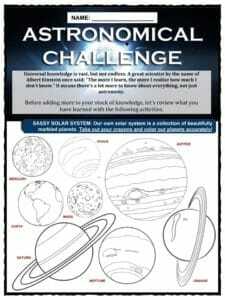 Astronomy originated from the Greek word “astronomos” meaning star-arranging. 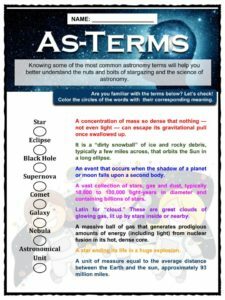 Latin used the term “astronomia”. Anaxagoras suggested in 450 BCE that the stars were actually suns, similar to our own, but located at such vast distances that we’re unable to feel their heat back on Earth. This belief led to his exile from Athens. Aristarchus of Samos in 280 BCE suggested heliocentric theory whereby the Earth and planets revolved around a stationary sun at the center of the universe. 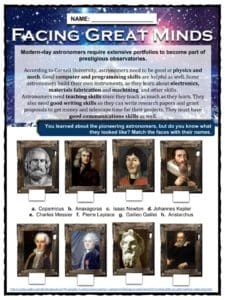 Around 600 BCE onwards, Greeks such as Pythagoras, Thales of Miletus, Plato and Aristotle turned astronomy into theoretical science concerned with the structure of the universe. Modern astronomers had more advanced theories about astronomy but not all of them were accepted. Religious beliefs and science began to go their separate ways. Copernicus published his book, De Revolutionibus Orbium Coelestium, which supported that the sun is the center of the universe. Johannes Kepler observed that the planets moved in elliptical orbits around the sun, and so proposed his three laws of planetary motion. By 1687, Sir Isaac Newton agreed that the Earth rotated around the sun and also established the law of universal gravitation, bringing on a new age of physics and enlightenment. In 1798, Laplace proposed the concept of black holes and by 1817 Charles Messier had compiled a list of 103 deep sky objects he identified as nebulae, star clusters and galaxies. Astronomy in the U.S. slowly flourished in the 19th and 20th centuries. Observatories were built by private institutions and by wealthy enthusiasts such as Andrew Carnegie. 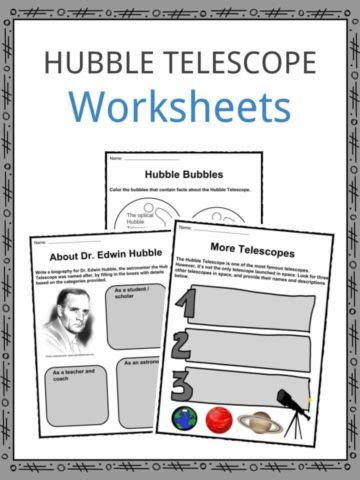 His funding developed a 60-inch telescope in 1908 and a 100-inch telescope in 1919 at Mt. Wilson Observatory. In Russia, the Russian Pulkovo Observatory’s fifteen-inch telescope observed Halley’s Comet’s transit of 1843. After World War II, engineers and physicists with their instruments, techniques and methodologies moved into astronomy. Modern tools were developed by the U.S. and Russia. Satellite exploration gave humans a taste of space outside the confines of the Earth. Russian cosmonaut Yuri Gagarin was the first man to walk in space. The U.S. then sent Neil Armstrong, Buzz Aldrin and Michael Collins to the moon in 1969, making them the first three men to set foot on an extraterrestrial terrain. Believing that the solar system is not the only one of its kind, scientists explored further. The first extrasolar planets were discovered in 1992, and more than 3,700 such planets are now known to exist. 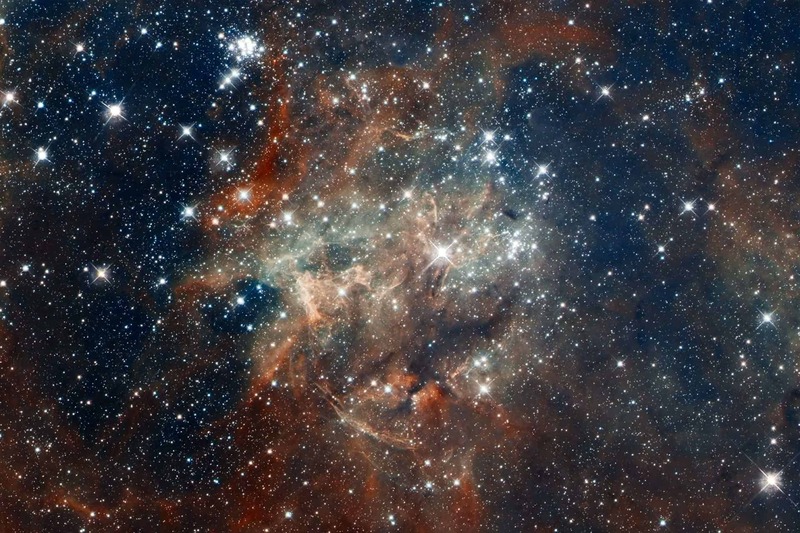 After more observations, scientists also discovered that the sun is a star – just one of the billions in the Milky Way galaxy. 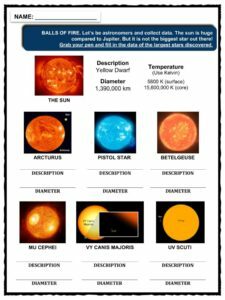 It is an average-sized star compared to many others of different colors, sizes and gravitational effects. There are even pairs of suns called binary stars. Galaxies are normally classified into three principal types according to their appearance: spiral, elliptical and irregular. 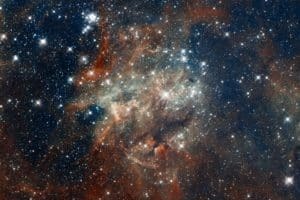 Beyond the galaxies, astronomers have observed further and learned that there is more matter in space than originally thought. Observation of black holes, star nurseries, voids, pulsars and the recent discovery of dark matter has been aided by the development of space instruments. The positions and apparent motion of the stars through the seasons enabled sea voyagers to navigate with moderate accuracy. Isaac Newton’s laws of motion and gravity emerged from the analysis of planetary and lunar orbits. We now know that despite the fast orbit of the Earth around the sun, the Earth’s gravity is what keeps us from floating away into space. Observations during the 1919 solar eclipse also provided confirmation of Albert Einstein’s general theory of relativity, which gained further support with the discovery of the binary pulsar and the observation of gravity waves from merging black holes and neutron stars. In 1977, John O’Sullivan developed a method to sharpen images from a radio telescope. This same method was applied to radio signals in general. This astronomy-derived invention was the core concept of the wireless local area network (WLAN) – Internet! X-ray observatory technology, originally for space observation, is also used in current X-ray luggage belts in airports. The power of science is able to provide the accurate predictions of phenomena such as eclipses and the positions of the planets. 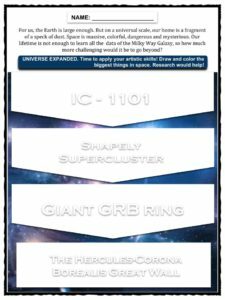 This is a fantastic bundle which includes everything you need to know about astronomy across 24 in-depth pages. 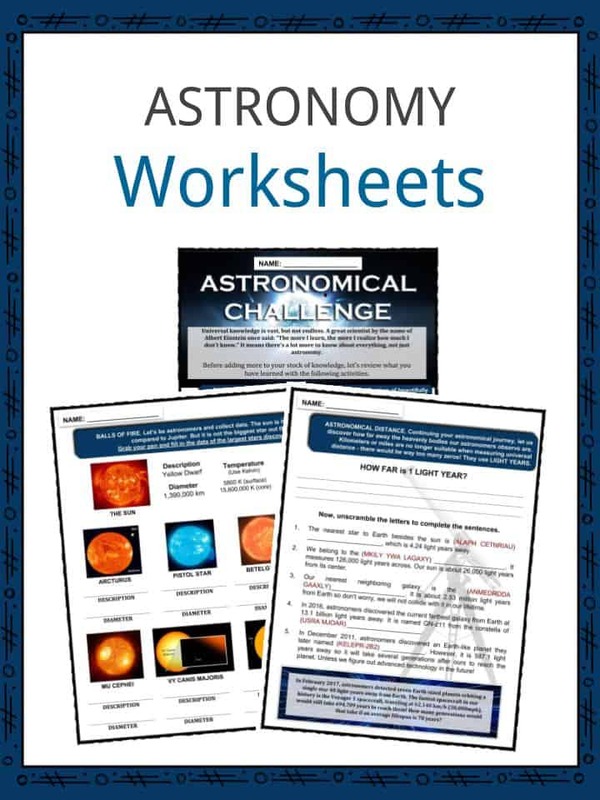 These are ready-to-use Astronomy worksheets that are perfect for teaching students about the astronomy which is the study of the sun, moon, stars, planets, comets, gas, galaxies, gas, dust and other non-Earthly bodies and phenomena.